For Admirers of Nature and Scenic Beauty. 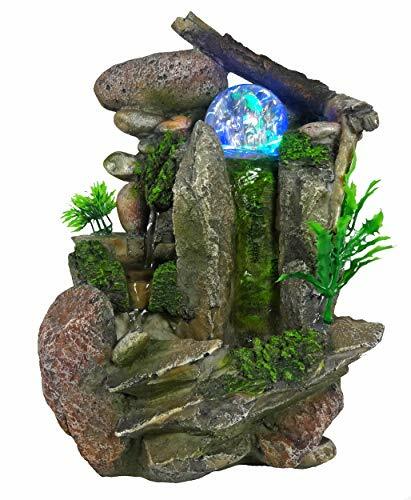 This magnificent indoor water fountain is a must collection item for nature lovers and will leave you stunning. Our craftsman have made every effort to bring out the beauty of nature and is one of our most exquisite designs. The water in this fountain falls from a rock top in multiple directions. From the front, the water falls directly into nature reservoir and is the highest fall. From the side it cascades onto another rock formation before finally falling into nature reservoir. The fountain includes color changing 4 LED lights to set the mood. The LED lights are embedded under the tree branch and stone and reflect beautiful colors. Magnify the pictures at the top. Note the texture of the branch and rocks and their curves and edges. Also note the moss on the rocks. There are also some green plants around. Note the texture and colors of the rock formation, stones and the surrounding area. Tip #1: Read the instruction manual. Tip #2: Make sure the fountain pump is properly immersed in water. Tip #3: All pumps are tested for quality assurance. If you hear pump noise then it is because the pump is not properly immersed in water (try putting in more water, refer to instructional manual) or not properly placed / laying flat inside the fountain (try place adjusting the pump slowly in the fountain until pump noise goes away completely). Tip #4: For first time use, we recommend turn on the fountain first and when water starts running then place the crystal ball on top (this is to build water pressure and tension). No need to remove crystal ball after that. Tip #5: Note that water pumps do not come with on/off switch. Tip #6: You can adjust water flow of the pump. Refer to instructions manual. Tip #7: Relax, enjoy and melt away the stress! Size: 18.5 x 14 x 26 cm. Adds the soothing sounds of water to any home patio or office setting. Features LED lighting to illuminate the fountain. * Color can vary slightly on each fountain. Lighting can be different indoors and out as well as differences in computer monitors. Some fountains may appear darker because of the lighting in the room. So slight color variation is not a cause for return. Click by "GiftsRDecor" above to view more items and great ideas. If you have any questions about this product by GiftsRDecor, contact us by completing and submitting the form below. If you are looking for a specif part number, please include it with your message.